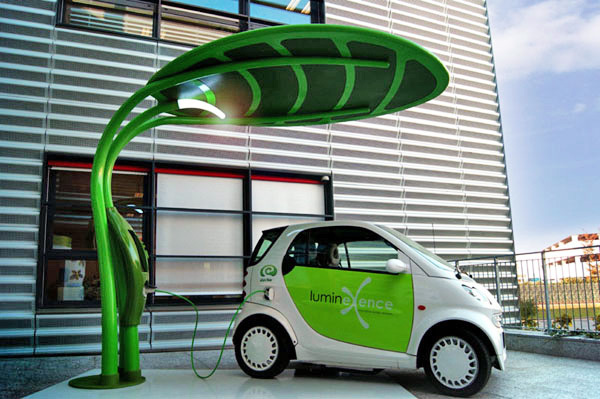 Leaf-Shaped Lotus Electric Vehicle Charger Doubles as a Solar-Powered LED Streetlight! Springing up from the ground like a large leaf, the Lotus is a solar-powered electric vehicle charger that doubles as an LED streetlight and a sheltered bench. Perfect for parks and parking areas alike, the Lotus features a 2.8 KW photovoltaic surface, built-in LED lights, and a waterproof Scame electrical outlet that can be used to charge an EV. The solar leaf is designed to be produced in a wide range of eco-friendly paint options, allowing it to blend in with its surrounding environment. Lotus was designed by architect Giancarlo Zema for Bergamo-based LumineXence and it was sponsored by a pool of leading green companies like Solarday, Siderpali, Eurozeta, Nord Zinc, and Scame Parre.